Description: Baker Park Reserve trail is part of Three Rivers park and trail system adjacent to Lake Independence, constructed on a rolling prairie which loops around a small lake. Getting There: The reserve is located about 20 miles west of downtown Minneapolis off of County Road 19. From Highway 12, take County Road 29 north to County Road 19, and follow County Road 19 north to the main park entrance. The park entrance is approximately ½ mile north of Dairy Queen on Cty Rd. 19. Or Travel on Hwy 55 to County Road 19, turn south and follow 19 to the main entrance. Entrance will be on your left. Parking: General parking at Three Rivers parks and trails is free for personal vehicles. Reservations and fees are required for premium parking areas and certain vehicles. Difficulty: With its smooth asphalt, low usage and consistent moderate size inclines, Baker park is prime territory for anaerobic interval training, sport specific muscular power development and inline skating skill technique refinement. Due to lengthy moderate inclines and corners requiring stopping and turning skills at speed, we give Baker Park Reserve trail an intermediate trail difficulty rating. Usage: Due to its remote location, the number of users is far less than other popular locations such as Lake Calhoun or Dakota Rail Regional Trail. Surface Condition: Since the surface is fresh smooth asphalt, the condition is very good. Scenery: With nearly 2,700 acres of natural lanscape including a view of prairie and lakes with Trumpeteer Swans, Baker Park Reserve’s inline skating trail is a beautiful not-to-distant remote getaway from busy city life. The trail offers fantastic views during fall leaf color changes in late September early October. Water: There is one fountain pump near the northwest end of the loop. We recommend bringing a personal water source, snack and minor skate repair tools. 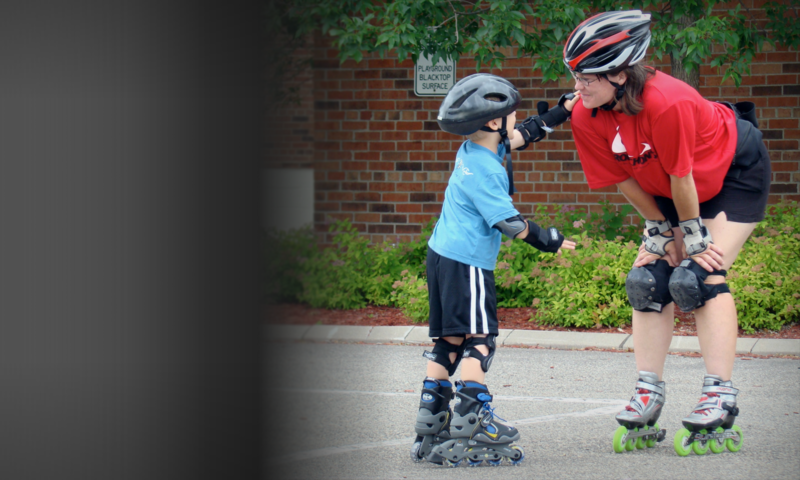 Skating ability recommendations: We recommend proficiency in OSB Level 1 – 4, and trail skate classes . Skaters’ who can stop, start and turn with ease on flats and down moderate inclines; are able to employ the defensive skate position, stabilizer, heel brake stop, heel pump stop, grass stop and modified trail stride are prepared for Baker Park Reserve Trails. Due to its remote location, we recommend skating with a friend and cell phone. Fitness recommendations: We recommend skaters can skate at least 12 miles on beginner inline skate trails such as the greenway with some ease. Other Trails that Connect: If you are interested in combining endurance with interval hill skating exercise, we recommend exploring Lake Independence Regional Trail which intersects with Baker Park Reserve trail. Commentary: The adjacent park has numerous other recreational facilities for swimming, boating, picnicing, camping and golfing. Lesson Meeting Place: We will meet you at the main entrance parking lot on Hwy 19. Parking fees apply. An alternate option is parking on the residential streets and walking or rolling to the park’s main entrance.